The Norwegian Public Roads Administration and Norled have signed an agreement for the construction of the world’s first hydrogen-electric ferry. The new ferry, with at least 50% of its energy requirement met by hydrogen, will go into operation in Rogaland, Norway, in 2021, and will generate zero emissions. It will connect National Road 13 between Hjelmeland, Skipavik and Nesvik and will be able to carry up to 299 passengers and 80 cars. “We are very excited about the upcoming development contract for the world’s first hydrogen-electric ferry. 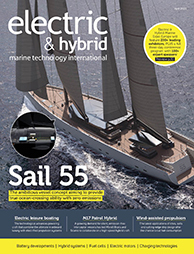 Norled wants to be a driving force for the use of green technology, and we are grateful for the opportunity to build this potentially game-changing new vessel,” Lars Jacob Engelsen, deputy CEO of Norled, told Electric & Hybrid Marine Technology International. Norled’s battery-powered MF Ampere ferry has received considerable international attention since its launch in 2015. By 2022, the battery technology that Ampere was piloting will be implemented in 72 ferries in Norway, according to Engelsen, who hopes that the new hydrogen ferry will be similarly successful. 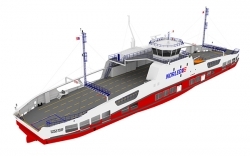 Engelsen told Electric & Hybrid Marine Technology International that the new ferry will use liquid hydrogen, but that Norled is yet to decide on the shipyard where it will be built.